Boy, do I feel foolish. 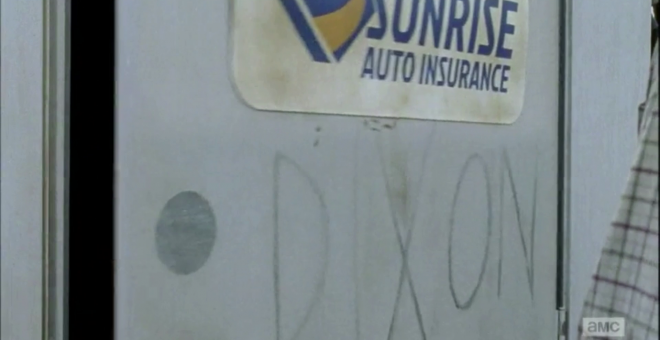 For weeks I wondered how Daryl, Abraham and Sasha — last seen driving down the road being followed by a countless number of zombies — were going to get away from them in the end. 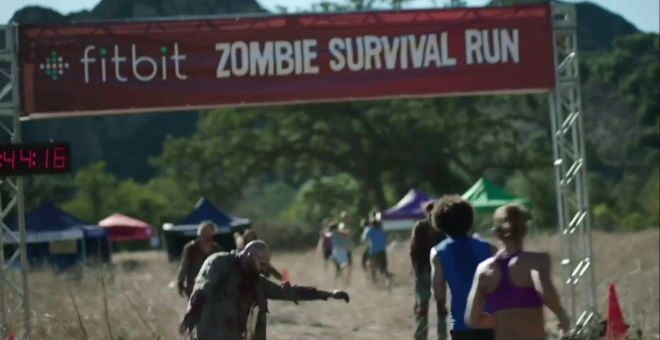 Turns out, since zombies move really slow, they simply kicked it in gear and drove really fast. But then they ran into trouble of a different kind when their vehicles were ambushed by a gang of Wolves, who opened fire. The ensuing fight wound up splitting the traveling trio into two groups: Abraham and Sasha, who grabbed their own weapons and fought back, and Daryl, who escaped into the woods on his motorcycle. 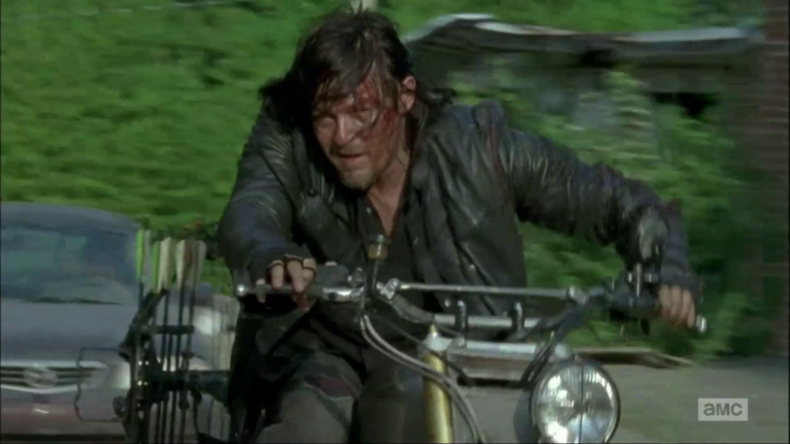 Daryl rode his way into some strange, burnt, black, Tim Burton-y area and collapsed. Then things got worse when he was blindsided by three unknown survivors — he caught the first two, but the third hit in the back of the head, knocking him out. When Daryl regains consciousness, they’ve stolen his crossbow and have tied him up, believing him to be one of the Wolves. He’s got no W, but that doesn’t seem to convince them. 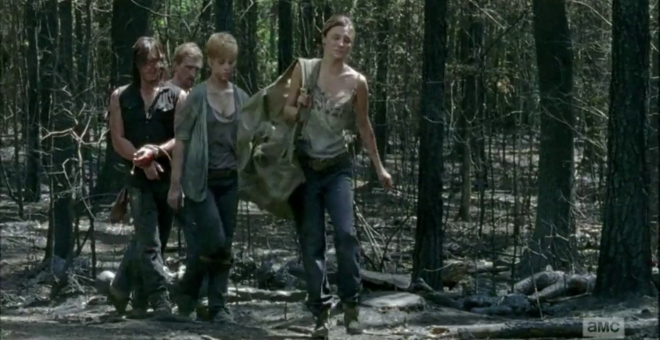 As the three lead him away, they spill their story: the woods became full of Walkers, and they dealt with it by setting the place on fire, hence the blackened surroundings. Then they were recruited by the Wolves, but eventually had enough of their cruelty and escaped from their camp. Now the Wolves are after them. 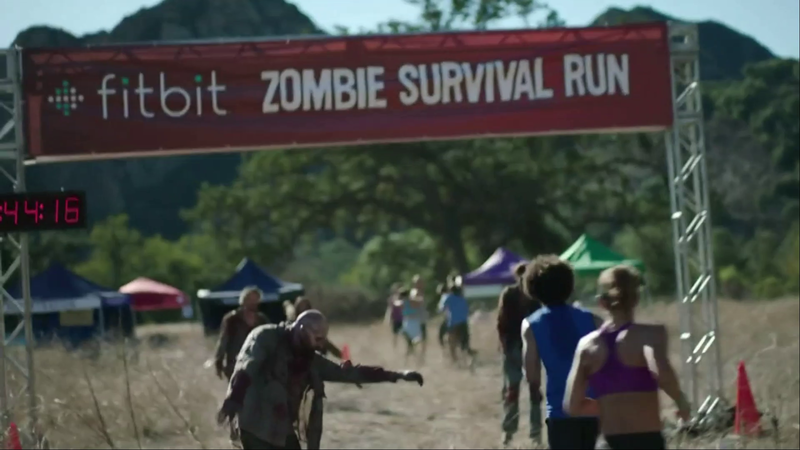 They’re going to a building with a fenced-in area that they’ve been hiding in, but once they get there, they see the place is full of Walkers now — and they’re in shock that someone named Patty is probably dead. 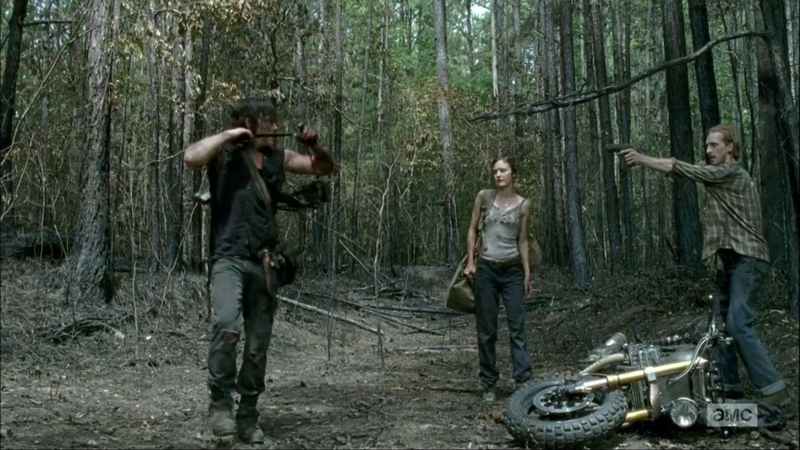 Daryl sees his chance, reaches for the bag his crossbow is in and sprints away as fast as he can. He thinks he’s finally found a spot to rest, but a Walker approaches and he barely has time to yank his crossbow’s awkward shape out of the bag before the zombie reaches him. 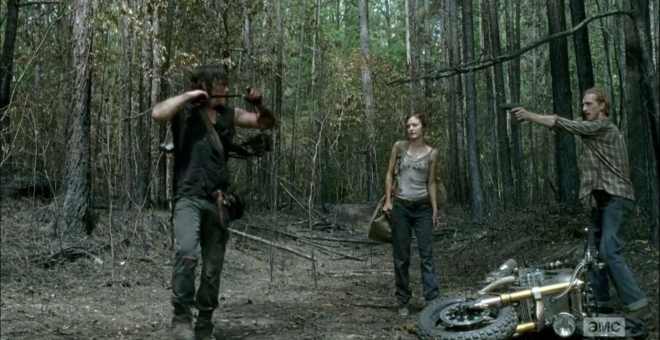 Firing his arrow just in time, Daryl then looks inside the bag out of curiosity to see what else was being stored there. 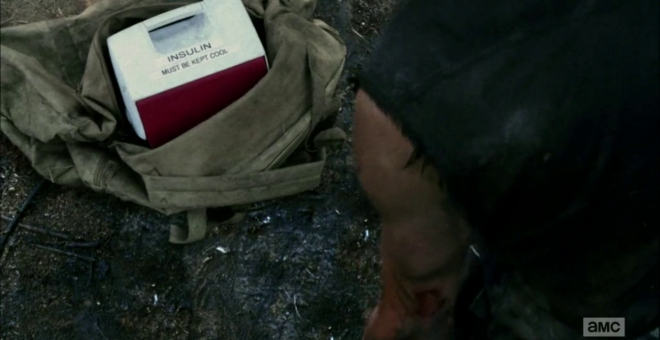 He finds a cooler full of insulin. Cue nervous tugging at the collar. Well, now what? 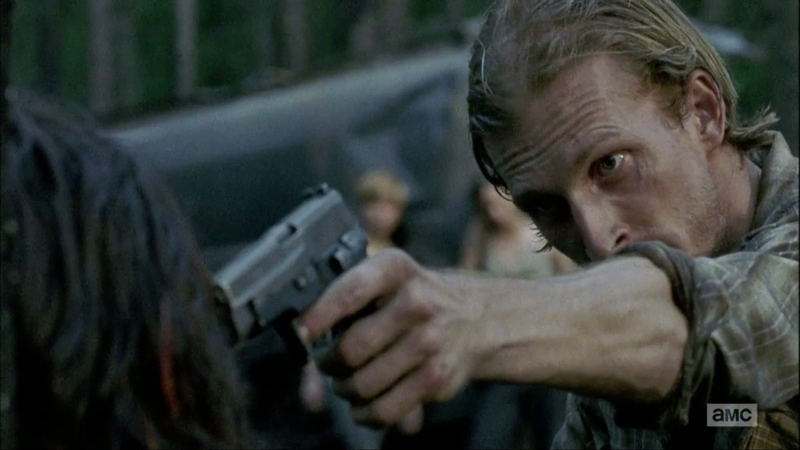 If the younger girl goes into diabetic shock it’ll be Daryl’s fault, but if he goes back, would they capture him again? 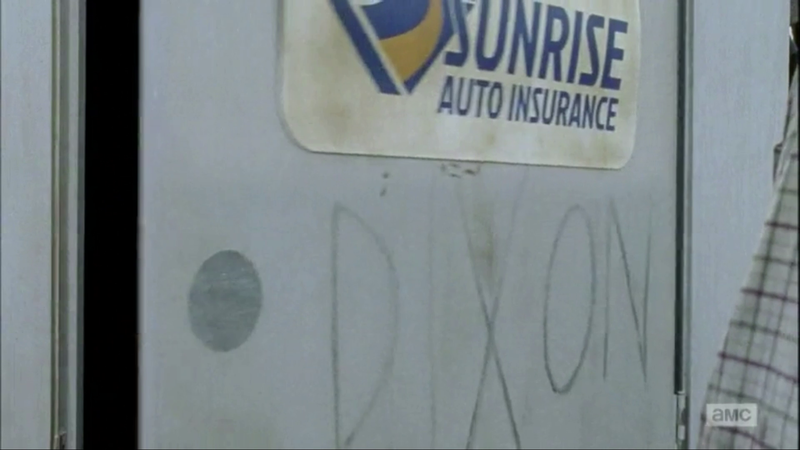 ….HAHAHA, of course they won’t, he’s Daryl and they aren’t. 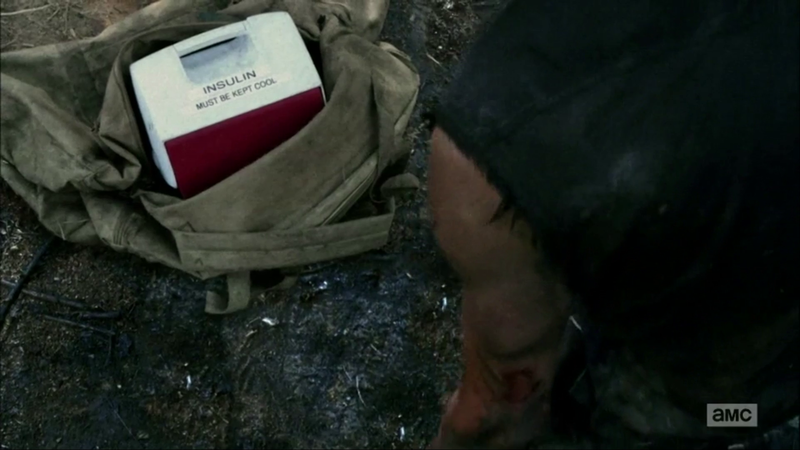 He sets off back in their direction with the cooler and a loaded crossbow. 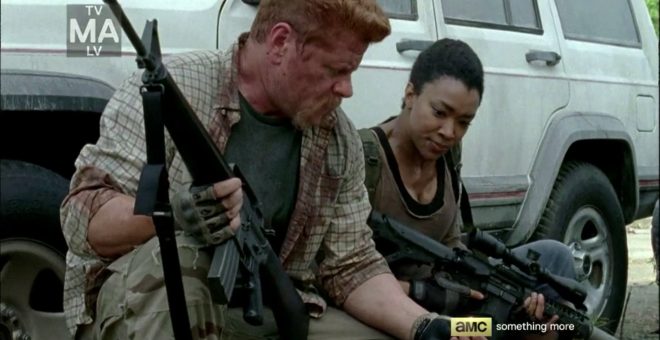 Meanwhile Abraham and Sasha scout out the area now that all the Wolves are dead, and start searching an insurance company office for supplies. You know what would have been fun? If a pudgy zombie with brunette hair and a “FLO” nametag came out of this door. Of course that wasn’t going to happen because it would be a plug and The Walking Dead doesn’t sell out. …..Outside of the commercial breaks, at least. Up on the building’s roof, Abraham found himself in paradise when he discovered a case full of rocket launchers and a box of pristine Cuban cigars. The episode where he uses the former is going to be a grand one. 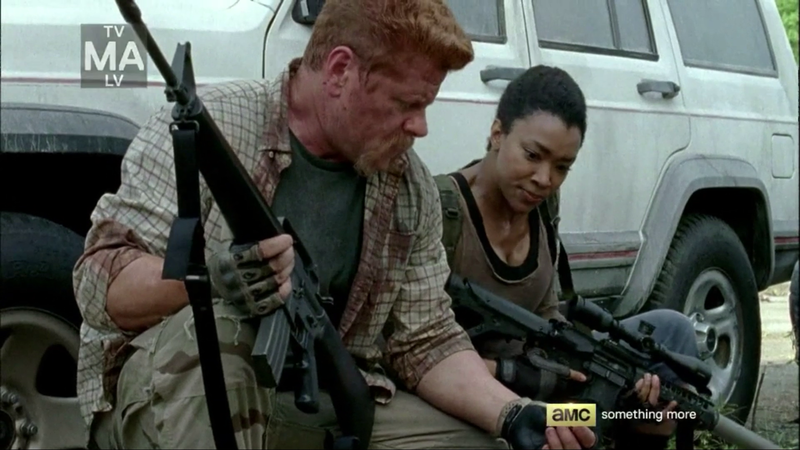 So….Sasha and Abraham, huh? How are you feeling about these sudden pairings lately? They’re not workin’ for me. I wrote an essay last year about love stories in Hollywood and how hard they are to write, and I came to the conclusion it really isn’t something that can be forced — you won’t know if certain characters truly have chemistry with one another until you’ve spent a certain amount of time with them. 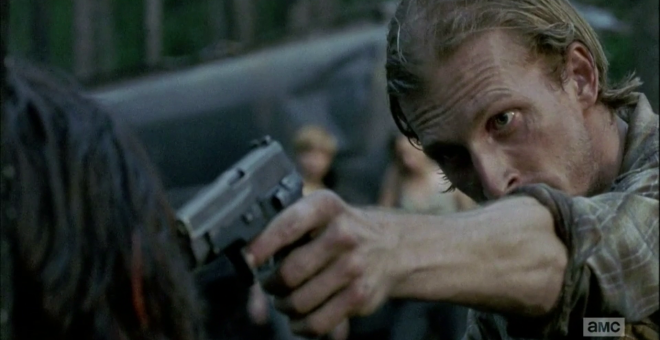 Right now, the strongest relationship the show has is…..um, Glenn and Maggie, whoops. None of these new couples are capable of filling the hole yet. Back to the adventures of Daryl. He finds the trio again and hands them back their bag, but demands something in return. Aside from the bag, though, they didn’t have much. 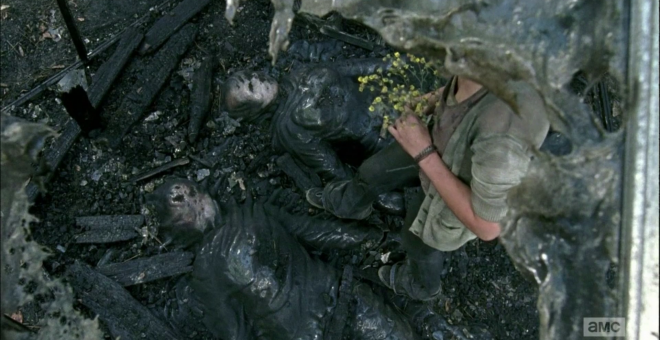 The oldest has this wooden figure he’s been carving, and Daryl says that’ll do and takes it. 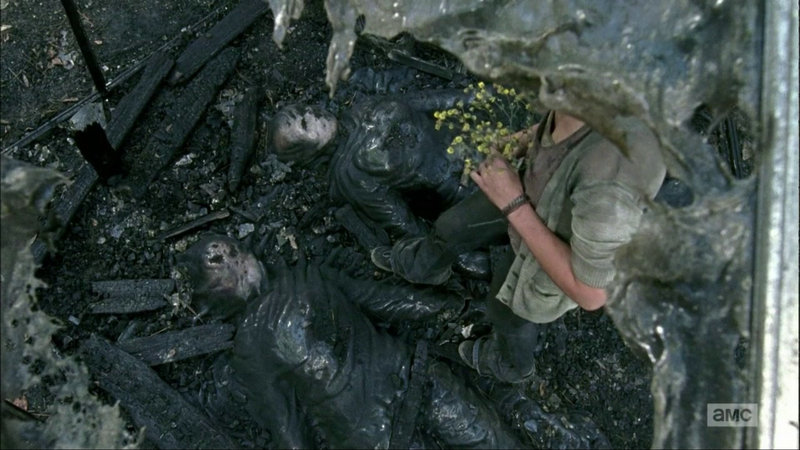 Norman Reedus said in an interview after this episode aired that it’s not like Daryl collects wooden figures, he just isn’t comfortable with being TOO nice. Unfortunately the Wolves come back at that point. They try to hide, but the diabetic girl starts going into shock and needs a shot immediately — what to do? 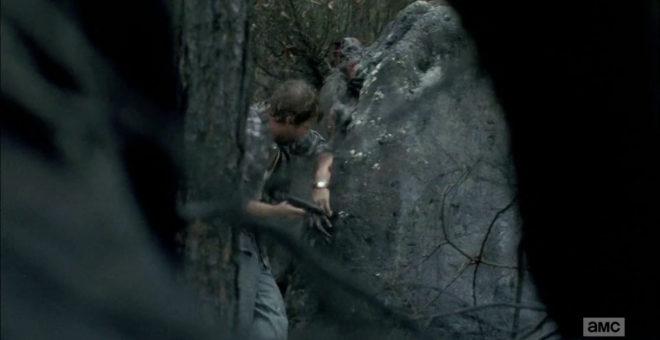 Daryl notices a Walker stuck between two large boulders and gets an idea. He makes some noise so that one of the Wolves heads his direction, and doesn’t see the Walker there until it’s too late. He howls that he’s been bit, and they call off the search and drive away. 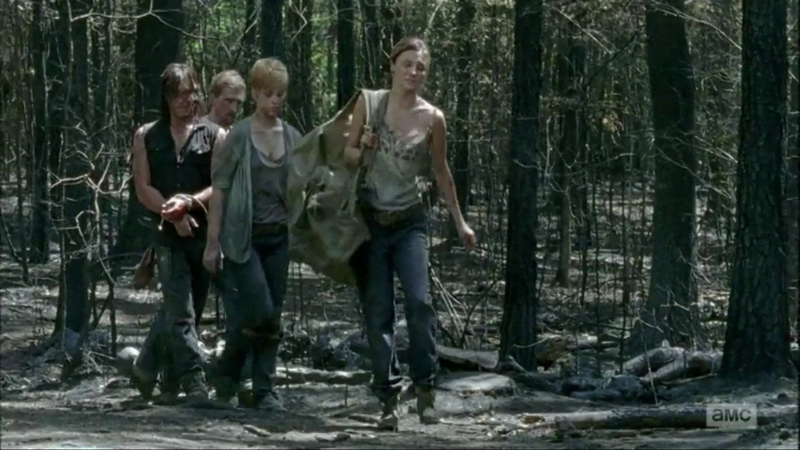 After they rescue each other, the gang shows Daryl the burnt-out cabin they once lived in and the saran-wrapped remains of their friends, who were an unfortunate casualty of the fire they set. They feel horribly guilty, but figure the least they can do is give them a proper burial. Here’s the thing about embalming, though…..
YOU MAKE SURE THEY’RE DEAD FIRST. The good news is that they won’t need to hunt for insulin anymore; the bad news is….yeah. Turns out whether he was a Wolf or not, or whether THEY were or not…..they were going to rob him all along. This time they steal his crossbow AND his motorcycle! The audacity! 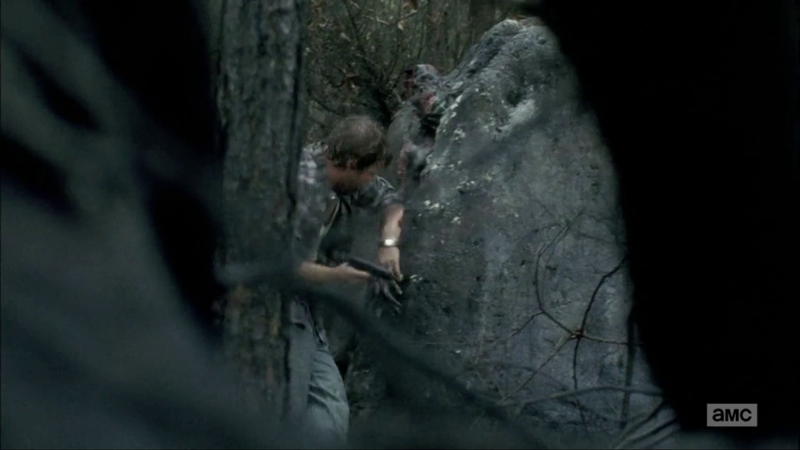 Daryl fears he’s stuck in the burnt woods, but he then uncovers some branches and finds a fuel truck. He uses this to return to Abraham and Sasha before he can pull any moves on her. 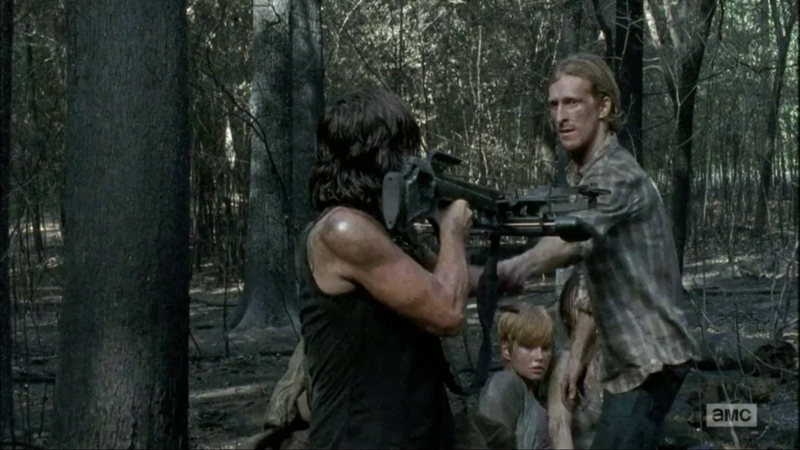 Having the fate of Daryl’s crossbow unknown is almost as traumatic as having the fate of Glenn unknown. Whenever a collectible figure of Daryl is made, no matter if it’s realistic or chibi or plush or full of beans, the crossbow is the accessory they always pack him with. How could Daryl ever be without his crossbow? I know he’ll survive (and he WILL get revenge on that pair eventually), but he’ll never be complete until then.